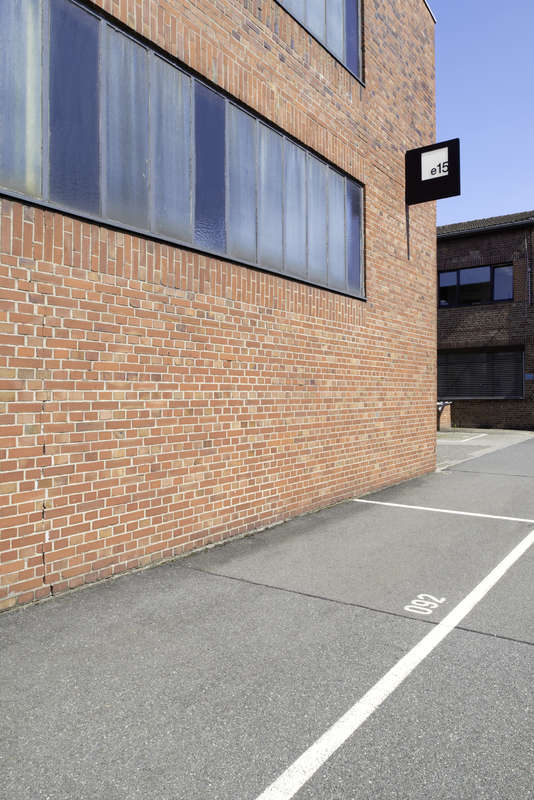 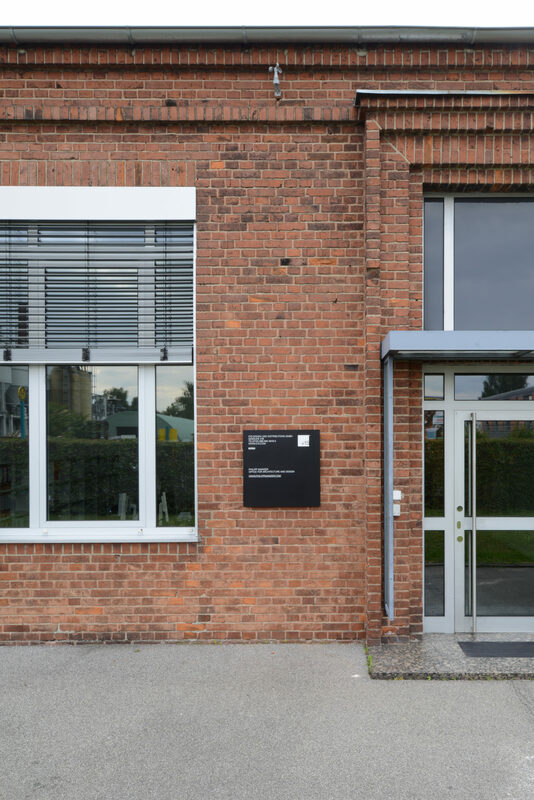 For the new headquarter for premium brand e15 a former site of the international industrial company Lurgi in east Frankfurt was converted. 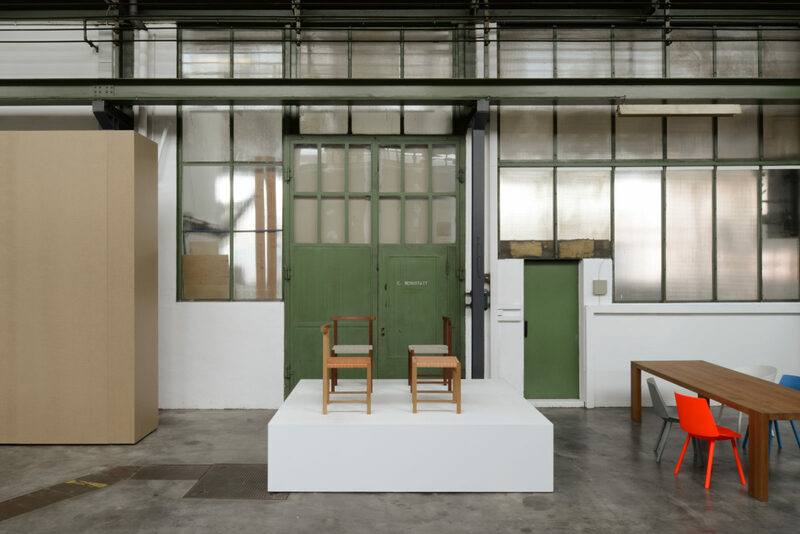 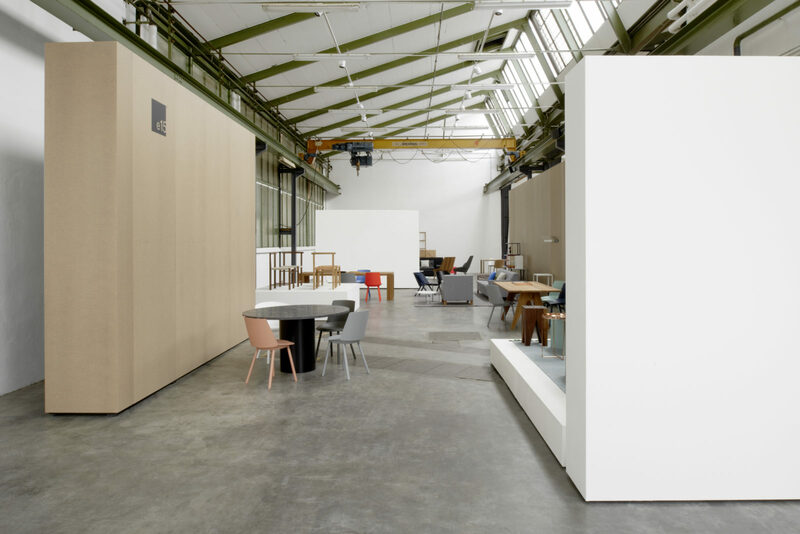 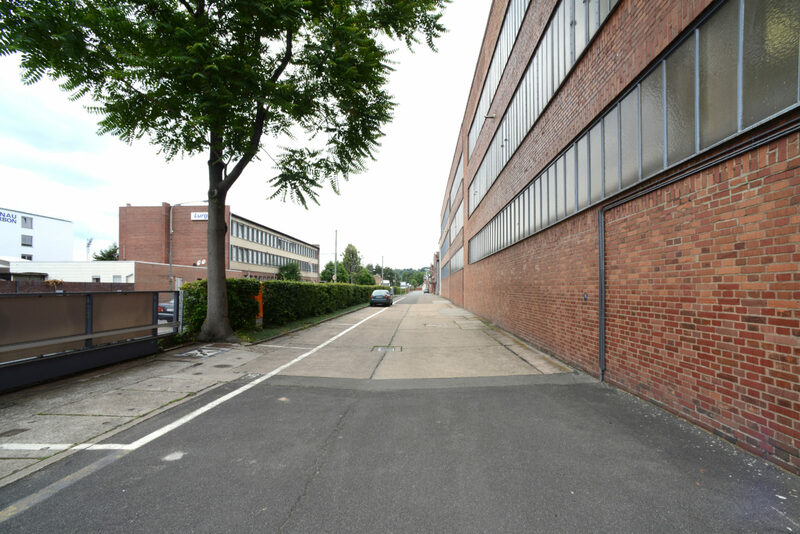 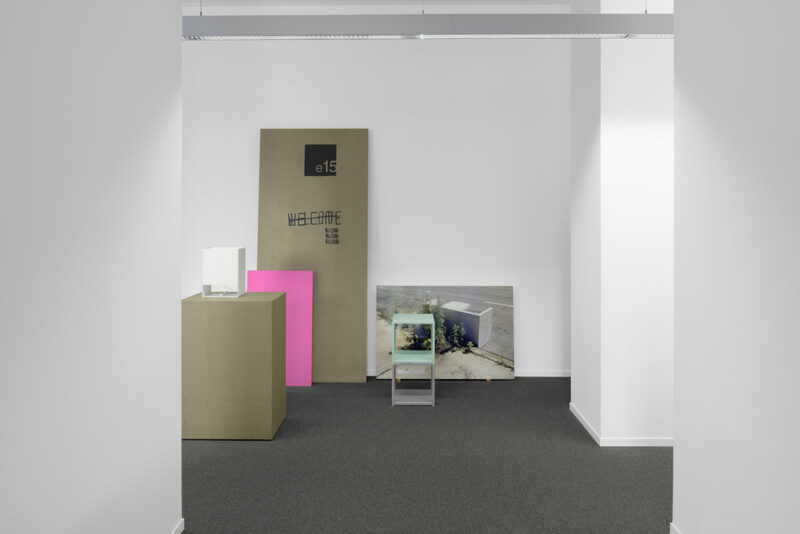 The scope included the conversion of a 540 sqm two-storey industrial building into offices, as well as the redesign of a 1230 sqm large space into logistic facilities and a further 425 sqm large building into a new exhibition and studio space for the modern furniture brand. 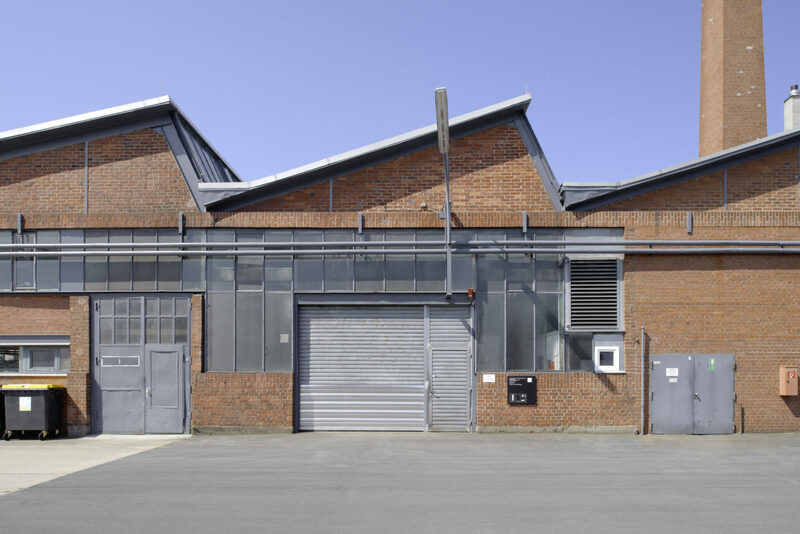 The former 540 sqm large canteen of the Lurgi company was converted into the new offices of e15 and PHILIPP MAINZER OFFICE FOR ARCHITECTURE AND DESIGN. 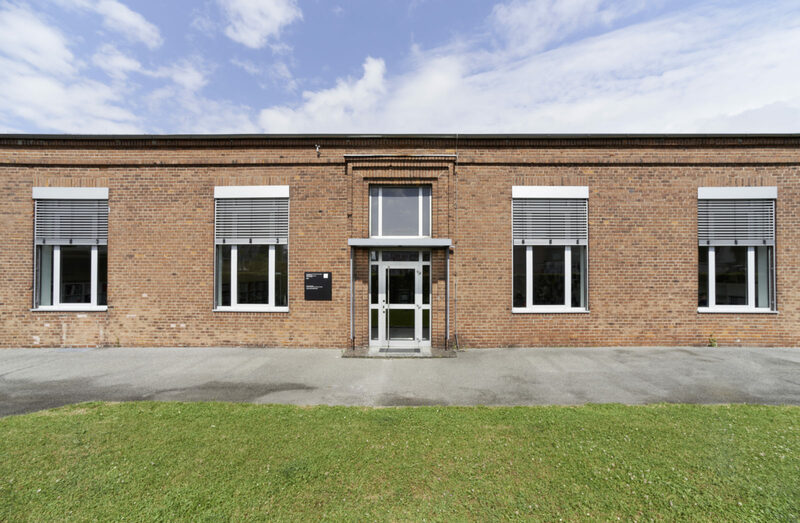 Retaining the industrial charm of the red brick architecture with its elongated saddle roofs, the generous canteen was completely gutted and a bright and spacious open plan office with acoustic ceiling was realised. 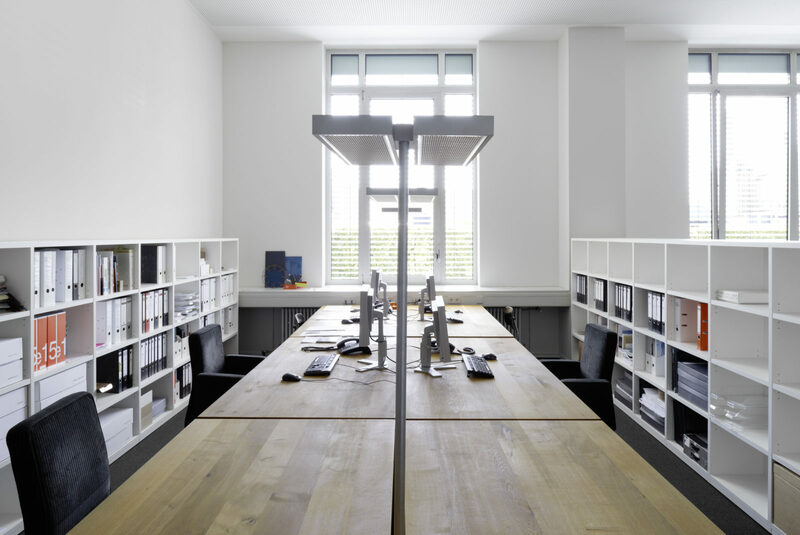 Without diminishing the generosity of the space, the different departments are visually and acoustically separated from each other by shelving. 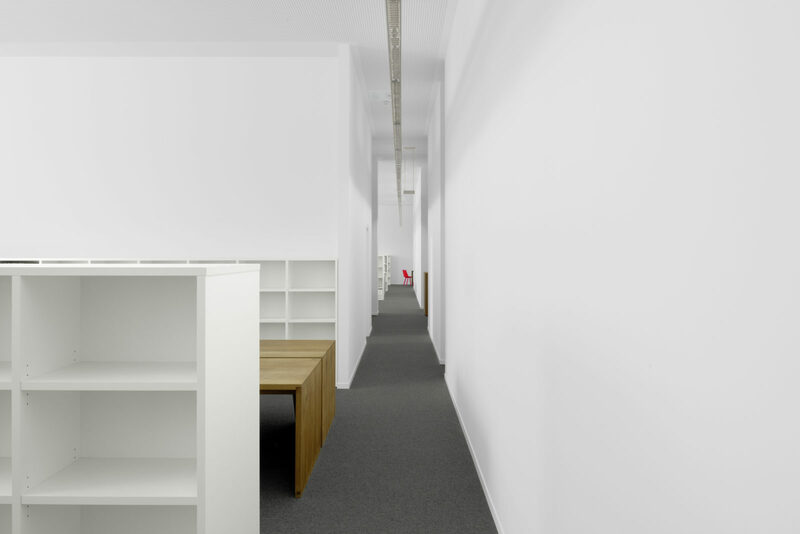 Spanning the length of the space separating walls were installed, which divide the workplace from the back office and storage area, further structuring the space. 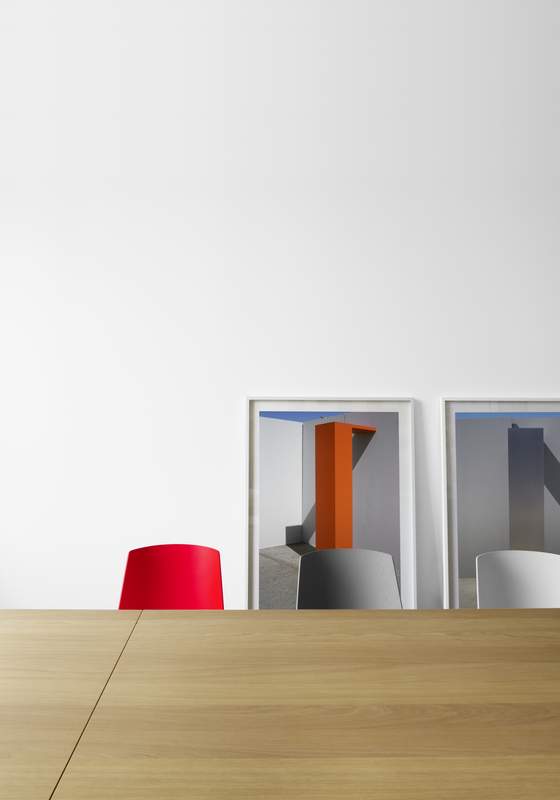 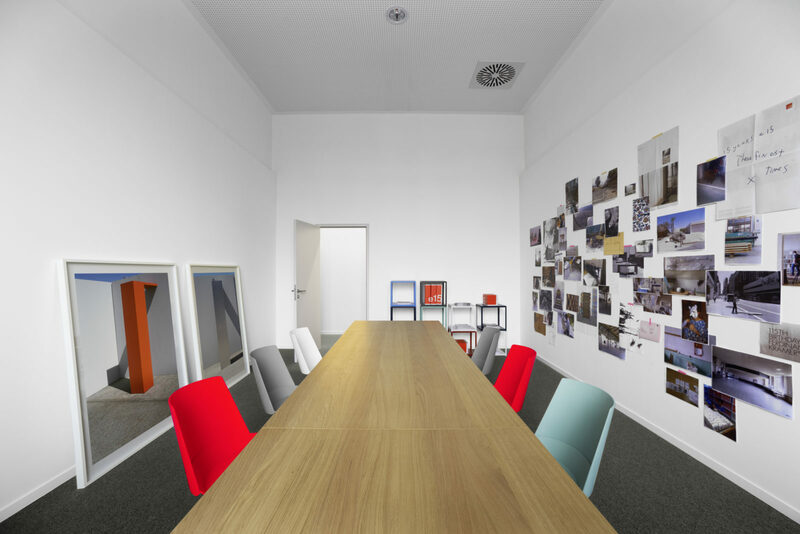 Desks in solid oak present a visually contrasting, warm highlight in the clear office interior. 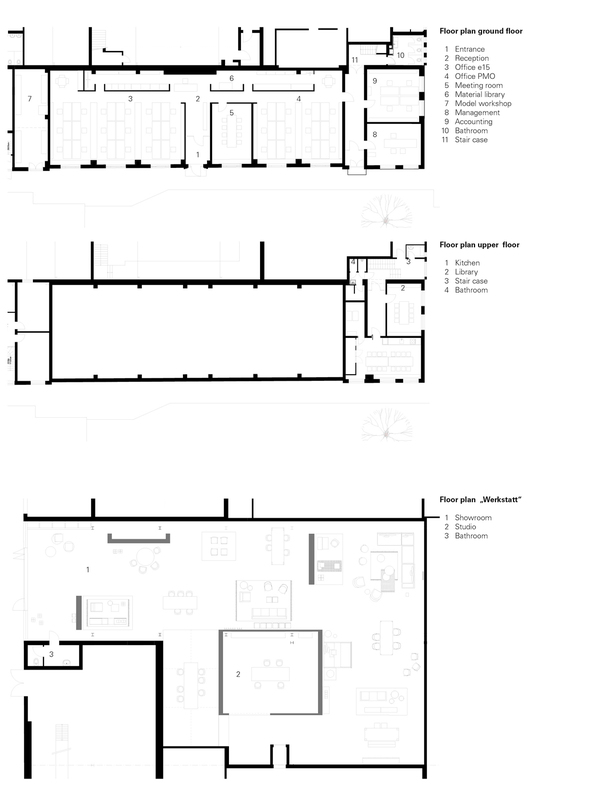 Using the existing building stock a generous meeting room and kitchen were created as well as separate individual offices for management and accounting. 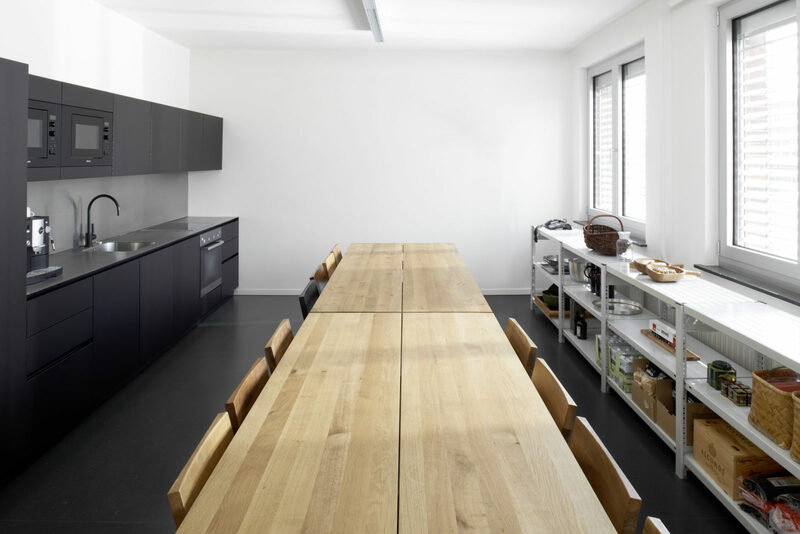 The first floor space was converted into a spacious communal kitchen and library, which offer additional work and communication space. 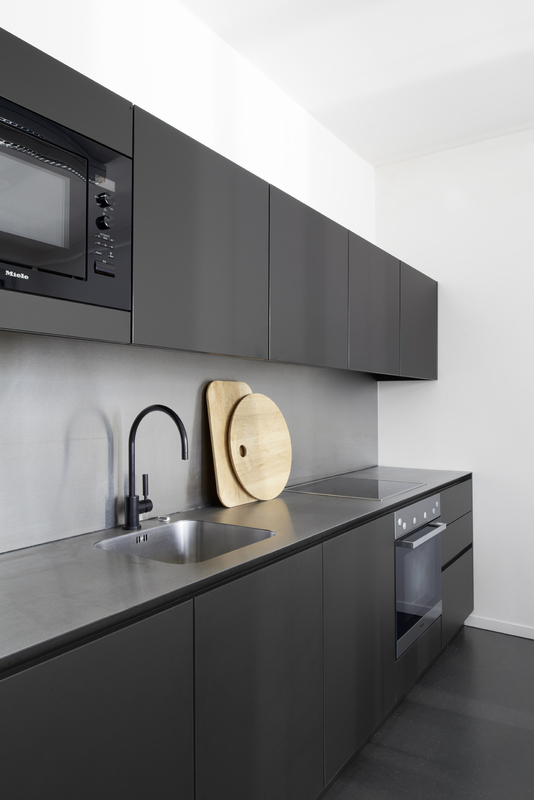 The specifically designed fitted kitchen from solid core panels dyed in black emphasise the humble character of the interior. 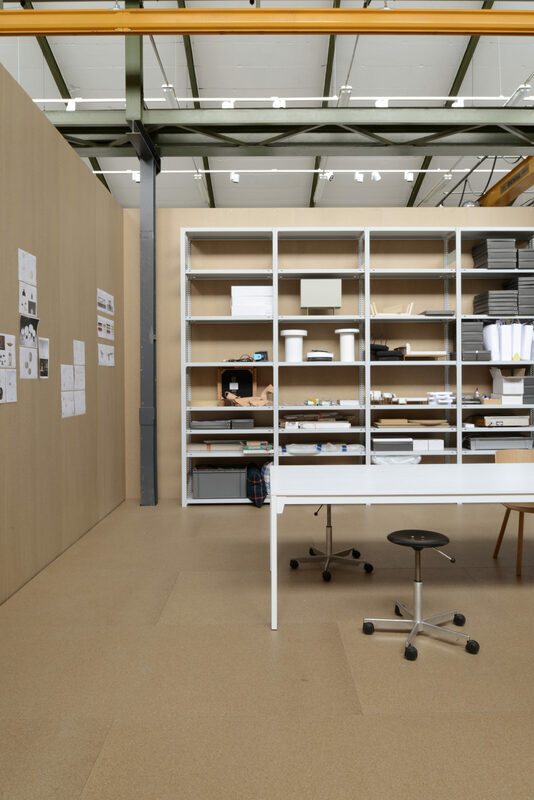 An additional industrial warehouse space on site was redesigned to function as a showroom and studio space. 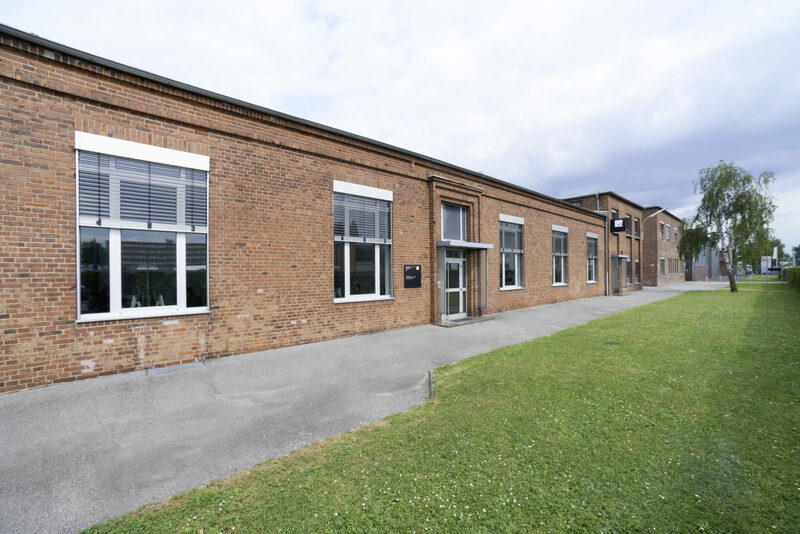 In the generous hall with its concrete flooring, existing ceiling construction and extending crane system, a room within a room was created, functioning as a think tank and meeting room as well as model making facility. 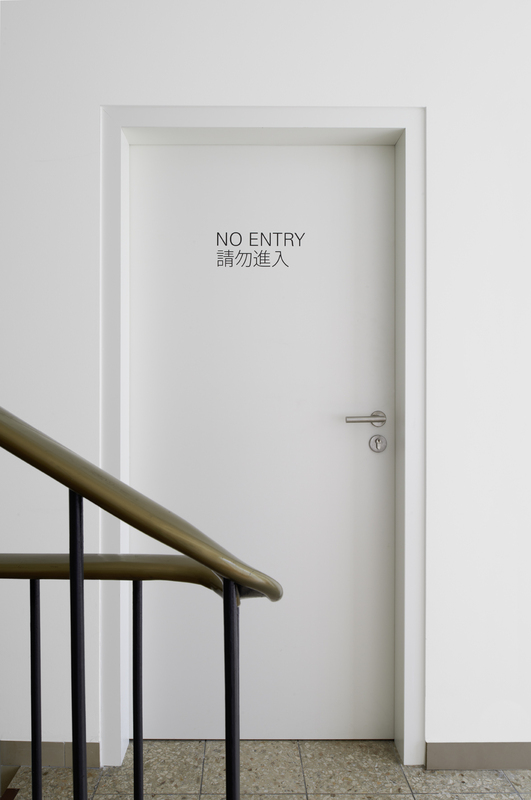 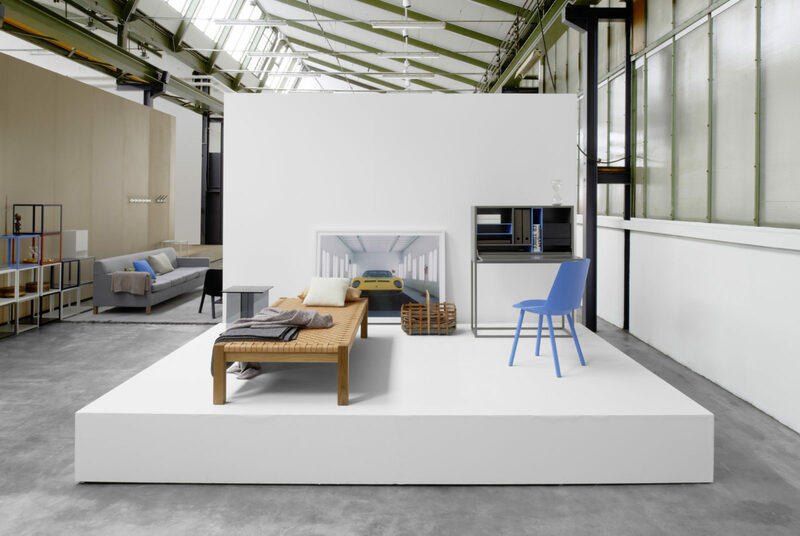 Constructed from clear lacquered chipboard, the structure underlines the authentic environment of this industrial space. 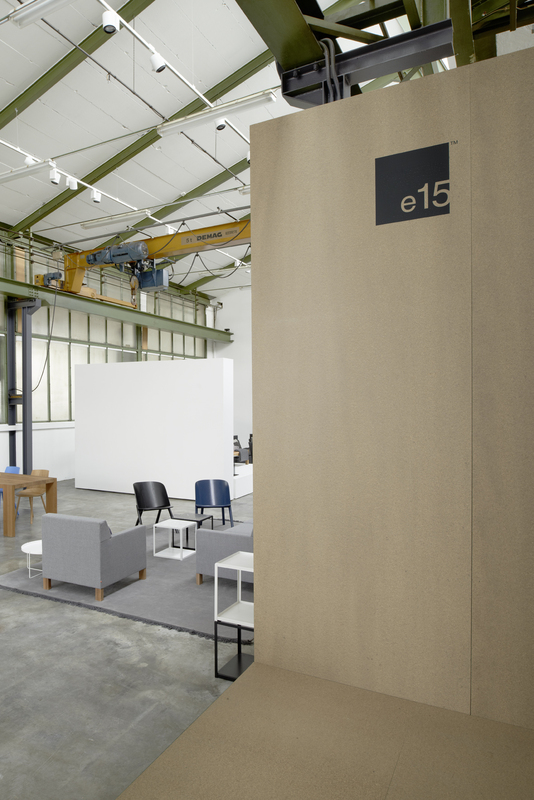 Additionally, a set of white walls and platforms divide the space generating individual presentation areas featuring the e15 collection comprehensively.